With the Turf Rail System, fleet and equipment managers can transition from working on outdoor power equipment to a truck in a matter of two minutes. 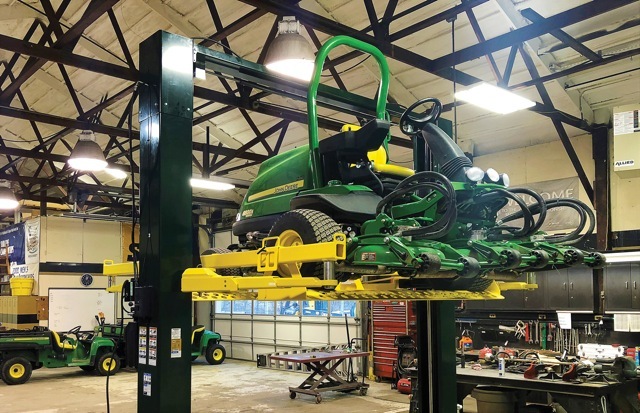 Tatom had designed Turf Rail after seeing a need in parks departments, golf courses, airports and the turf industry; however, it offers benefits to any shop where space is at a premium and workers handle a variety of equipment. He created a prototype and then took it to the parks department in Ohio’s shop. After a month of use, the park district critiqued Turf Rail, allowing Tatom to take that information and make changes, resulting in three different prototypes. 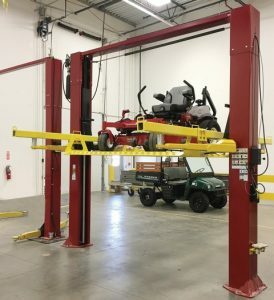 “After seeing the excitement of the employees that tested my product and the ability of the Turf Rail to lift a wide range of equipment, I filed my patent paperwork and began to critique my design to have the best product I could produce for the safe and effective lifting (in) both the outdoor and automotive industries,” Tatom said. Unlike other similar systems that might take hours to install, Turf Rail only takes between a minute or two. Rather than laying on the ground or kneeling in awkward positions, technicians can work standing beneath the vehicle or piece of equipment, with service height ranging from zero to 70 inches.